This is a fabulous platter crisply transfer printed in brown and highlighted with green and blue hand painting. The piece measures 17 3/4 " long x 14 " wide. The platter is decorated in an Art Deco pattern with a naturalistic inspiration, a kaleidoscopic design of stylized sunflowers and feathers. The decoration is bright and clear and coveted by collectors. The piece was made by Brownfield Potteries in the Staffordshire region of England. 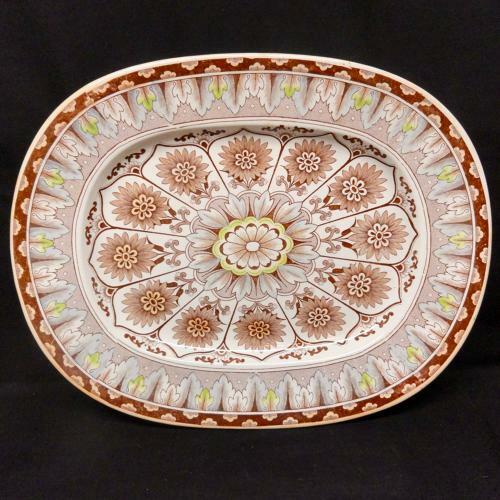 This is a fabulous platter from the Aesthetic Movement Era. Never Used. The piece displays beautifully and ready for use Great Condition. Early pieces in this wonderful pattern don't come along often, and the contrast and composition is especially beautiful.